Midway between Chicago and St. Louis in central Illinois, Inland Tool Company has been plying its trade since 1974. The contract manufacturer, with 58 employees, primarily provides metal-stamping services for the Tier One and Tier Two automotive industry from its 80,000-sq.-ft. Mt. Pulaski location. As a supplier to automotive Tier Ones and Tier Twos as well as to other markets, Inland Tool Company, Pulaski, IL, strives to leverage its diverse capabilities. To ensure dependable production in its stamping department, the company has invested in press controls with die protection and other features. To provide full services for its customers, Inland Tool Company offers expertise across a broad spectrum. That starts with upfront tool-design and -engineering capabilities. The company, with its inhouse engineering staff, designs complex progressive stamping dies as well as welding, machining and quality-control fixtures, and, where needed, specialized equipment to stamp, weld and assemble a variety of parts. Shop-floor capabilities include CNC machining for low- to medium-run production parts, and dedicated special equipment for high-volume machining. Full-service welding and assembly is another, with projection, spot and robotic arc welding often employing nut and bolt feeders to improve throughput. Fabrication capabilities center around a 4-kW Mazak fiber laser-cutting machine. Inland Tool Company employs several workcells designed and built inhouse, combining assembly, spot and projection welding, hot caulking, machining, and staking, with vision-system technology used to verify complete, accurate and wholly compliment operations. 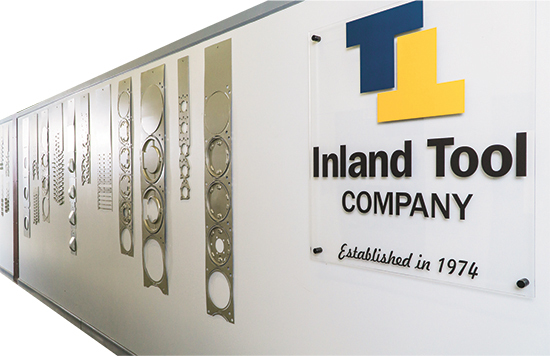 The company has set itself up to provide custom solutions for a variety of customer needs, and at the heart of it all are the Inland Tool Company stamping operations. With 28 presses ranging from small OBIs to 800-ton straightside mechanical presses, the company churns out large and small progressive-die stampings as well as parts produced via transfer lines comprised of tandem or line dies. Many of the presses feature servo-driven coil-feed lines, with tooling often equipped with electronic sensors and other die-protection measures. Press-feed lines and electronic sensoring demand much in the way of press controls, and the right press controller can provide a big assist in ensuring high productivity and consistent tool performance. That is why Inland Tool Company is careful in its press-control selection, according to Gary Mason, the company’s executive vice president and chief operating officer. This screenshot summarizes the capabilities delivered by a controller installed on an 800-ton mechanical straightside press used to produce automotive parts in progressive dies from high-strength steel. Inland Tool Company notes the controller’s ease of use as a major advantage. After bringing in a used 800-ton mechanical straightside press, the company set about with reconstruction—the press arrived in pieces—and reasoned that this was the perfect opportunity to modernize its control system. The choice made, Inland Tool Company added the press controller in 2014. Today, the standalone press, with a servo-driven coil-feed line, produces automotive parts in progressive dies from primarily 5-, 6- and 8-mm-thick high-strength steel. While the feed line does have separate controls, it has been configured to interact with the Automator II. As Mason mentioned, the press controller brings a host of features to the table for Inland Tool Company. Besides the aforementioned 15-in. 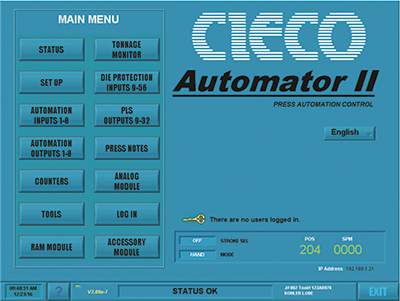 color touchscreen interface, the resolver-based Automator II delivers eight automation inputs (expandable to 56) and eight outputs (expandable to 32), with more than 145 I/Os available and is field-expandable, according to Cieco officials, meaning that options can be added easily after installation via a card insertion that automatically updates functions on the HMI. Also, HMI screens are field-editable, meaning that application-specific instructions can be added as needed. The press controller’s status screen provides a snapshot of press performance, ideal for quick and easy monitoring. A unique feature, according to Cieco officials: All controls and options are contained in the controller’s rack system, eliminating the need for excessive interconnections in addition to reducing installation time, easing troubleshooting and increasing reliability. The controller also provides onscreen diagnostics and status reports as well as the ability to accept as many as 200 security-password users. And, with individual programmability, each function can be enabled or disabled for each user. Other features: a Production Efficiency Chart that provides per-minute 24-hr. 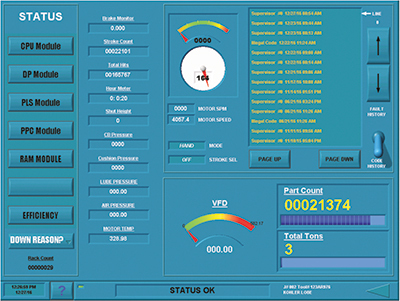 graphical view of production; editable help buttons for each screen; the ability to load PDF manuals, schematics, drawings and setup instructions for each die directly into the controller screen; and one-touch backup and restore of settings, jobs and PDFs to the controller memory or a USB stick. Mason sees the press controller as very helpful in tackling the just-in-time and volume demands inherent in auto-part production.